The second NY Rising Community Reconstruction Program public outreach meeting on Monday November 4, 2013 was less well attended than the first. Thank you Denis Collins for helping make up for that leading the discussion! If you do nothing else please just do that. 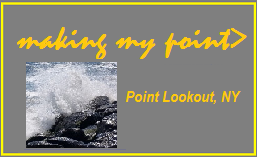 First, Don Kelly, of Point Lookout Property Owners and Point Lookout Historical Society cleared the air with the direct question, quoting Newsday , that the $3 million allocated to us is all going to this process, the consultants, the grant writers and not to the actual use of our locale. Amy Engel from Sustainable Long Island, who headed the meeting refuted that, explaining all those expenses are not to be taken out of the $3-6 million set aside for us. James Mc Allister, of NY Rising said “this is just seed money, there is more money out there”. The louder our community is, and the more involved it is, will carry weight for both studying what is feasible and then the aggressive seeking of money to get it done. If everyone gets involved, we could eventually get everything we need and want, maybe more. So please take the survey. We have a once in a one or two generation opportunity right now. Money is available to study and plan what will happen for infrastructure, storm mitigation, neighborhood, housing, culture, economic development etc for the next 1 to 2 generations. They’re looking out 30 to 50 years because they have the money to do it right now. This has not happened since World War II and even then, much of Long Island was just open space. Many of the problems we face are from the general lack of plan in the build up of Long Island. And all of that was done on infrastructure that was in place from the Long Island Railroad and Robert Moses 25-50 years before that. This is a truly unique, historic opportunity to modernize, and make our communities work well, be resilient against nature and have proper development for years to come. They’re really collecting our community thoughts and wish list. what would be great to have? What do we need -not just today, tomorrow, yesterday, and the storm; but 30 years from now, 50 years from now? If we could have anything that we wanted or at least anything that we need, what would that be? There is now money to figure what needs to be done. Then, there will be future money to do it, largely in the form of competitive grants. No single grant will cover the entire amount of any project, so multiple grants will be needed for each project. We need to make sure we are ready and able to apply to and receive all. Our end of it is we need to have the plan ready to go when the grants come available. And we have significant competition. None of whom must cover the amount of oceanfront, bayfront and inlet area we have, with so few residents and businesses. NY Rising are already banking dunes, storm drains and bulkheads as priority items and asked us not to waste time discussing them. They said besides those, “what else”? The meeting was largely spent getting further input from the local residents on what they thought were priority issues, based on what local residents said and ideas we forwarded last time. The general ideas came from us. These ideas are going to be delivered in the draft plan, which is just a draft for now, that will evolve and be finalized in March, 2014. “Ask nawt what yar town can do fah yew… ” Taking a 5 minute online survey is the least you can do. You can share that survey on your facebook / twitter group or even on your personal status. Share it on your businesses website. Please share that survey link and remember they really did ask for ALL residents and said that is all adults in your house. You may have to clear cookies from your computer or use a different computer / phone to do subsequent surveys. Next public meeting is probably not until January 2014! NY Rising Community Reconstruction Program(NYRCR) Map of our “assets”. To be fair for the record, since I previously wrote that they had not, NY Rising DID actually get the announcement email out to me yesterday. Additionally, the last page of the survey allows you to sign up for email notifications so go through the process and then sign up. It took me about 5 minutes. 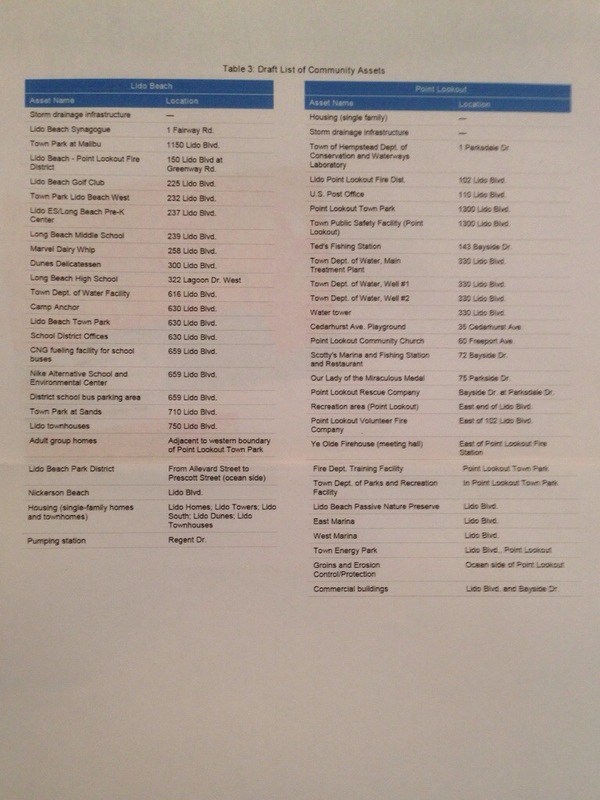 NY Rising Community Reconstruction Program(NYRCR) list of our “assets”. You should be able to click on that photo and see a larger, more readable version. 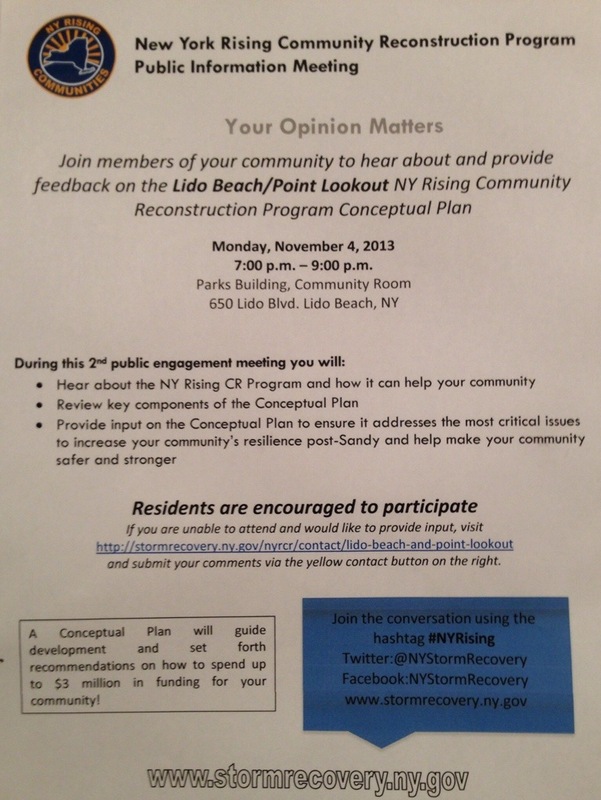 Community members of Lido Beach/Point Lookout are encouraged to attend a public information meeting on Monday, November 4, 2013 to hear a presentation about – and provide feedback on – the New York Rising Community Reconstruction Program conceptual plan. Also, the meeting will be discussing their “Conceptual Plan”. 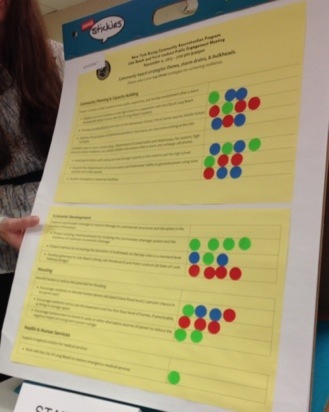 This is the draft plan that will be worked on and will be finalized in March, 2014. Getting word out of next Monday’s 2nd Public Engagement meeting. I actually did not get notified by them. I did get a hot tip though about this earlier and it has now been posted on their website. The public is invited to come learn about the NY Rising Community Reconstruction Program and to share their ideas with the Planning Committee. Click the photo to read the agenda items. And then submit comments via the yellow contact button. Better yet, don’t just comment, meet me there! How will the $ we are getting be spent?